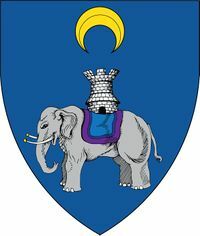 Azure, an elephant statant proper maintaining a tower on its back argent and in chief a crescent pendant Or. Lady Luned Gwyn, Baroness of Carillion (called "Lunaria"). Attended her first event, Quest, in 1999. After a few more events and Pennsic, became active in the SCA with the Canton of the Keep by the Endless Sea in the Barony of Carillion in 2003. 12th century Welsh born Romnichal "British Traveler". Meaning: To make better, lion beloved to be good/beautiful. Pennsic Volunteer: DART (4yrs), Disability Services (2yrs), Troll (1yr), Watch Cart Patrol (10yrs), Watch Desk Clerk (1yr), Watch Radio (5yrs). 2010: Dress for Her Excellency & Arab outfit. 2014: Tunics, dresses, & surcoats. 2 Tunics for Investiture. 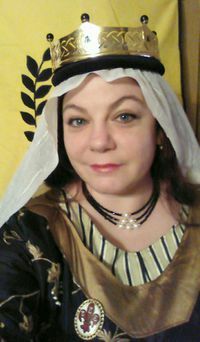 2015: Several Arab outfits and several Norse outfits. Several Indian Salwar sets for 2 children & Queen Elizabeth dress for child. Arab coat. 2016: Fighting tunic & pants for Fall Crown. Rus pants for Brennan & Caoilfhionn's Ducal Challenge. Carpathia Tabard. 2 dresses, chemise, & 2 matching bags for gentles first event. Saxon tunic and 2 Arab coats with undershirt. 2017: Carpathia Tabard. 3 Leines & 3 brats. "Combat" Leine. Linen Gambeson. 2 tunicas & Egyptian dress for Coronation. Doublet for Spring Crown. Overdress for Elevation. Norse dress, apron, and coat for Elevation. Turkish outfits for TRM. 4 Norse Tunics, 3 T tunics, 1 Leine, 6 outfits & 2 coats for children, and Turkish outfit for Pennsic. 2018: 2 Rus pants & undertunic for TRM, 2 Carpathia Tabards. Gambeson. 2 Hospitaler Tunics, 4 Carpathia Favors, Turkish Fencing Coat for Pennsic. TRM Turkish Garb for State Dinner. 3 House Carpathia Tunics, 3 undertunics, & cotehardie for Coronation. Please contact my husband, Baron Corcrán mac Diarmata, and my peer, Master Phillip the Facetious. I would prefer to be surprised. 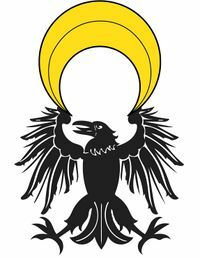 Preferred illuminated images/themes include Turkish/Persian/Arab themes, European Grotesques, Skulls, Norse, Elephants, cats and/or nature. 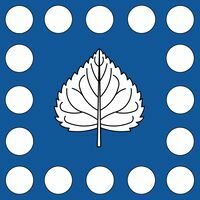 This page was last edited on 16 April 2019, at 00:28.